Hello! Long time lurker, first time posting. Thank you for all of your contributions and consideration to make this site a very valuable resource. I am making a table from ash wood. I started removing hardened glue with my hand plane and landed against the grain. The end result is some pretty massive tearout. I’d like to use an oil based stain (gray) and topped with Arm-R-Seal (matte). What is the best method to make this blunder as discrete as possible? Ouch. Beautiful table. Those look pretty deep. I might be inclined to try the wet towel and iron trick to raise those up and swell the wood. Then id use a card scraper and try not to dish it out too much. If that dont work, maybe some colored epoxy in there but that may stand out too much for your taste. I would also recommend some epoxy, but I wouldn’t color/tint it. I would try to put the stain on first in the areas that need to be filled. After the stain is dry, then fill them with clear epoxy. After that dries, then level the epoxy and get it up to a pretty high grit (320-400) before staining the whole piece. The stain won’t stick to the epoxy, but the sealed in stain color underneath should allow it to fit in with the color of your top. Honestly, no-one other than you will notice the ever so slight defect. If still need to fill, I would try Crystalac grain filler. It is clear shellac based grain filler. Does not absorb much stain color from oil based stain, much less than it does with water based versions (but never messed with gray colors). Using an entirely oil based finishing schedule on top of it, it will be compatible, and should be almost invisible. If you find the Crystalac filler absorbs some stain color, can hide the damage with some artistic work. Use some fine line artist brushes with custom mixed dark brown/grey stain colors (to match the color after staining) and re-create some faux grain lines on to filled area to match grain around the area. 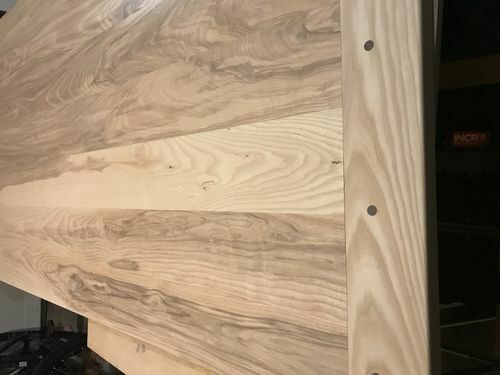 Will take some patience, but should be able to make the fill disappear to most everyone, except maybe a woodworking finishing guru looking for it. Chrisstef- thank you for the kind words! I saw an article/video from Marc (WW). Didn’t know if I could do it since I ripped the wood fibers (pictures don’t do it justice, haha). It is definitely worth a shot though! Breeze73- thank you for the advice! This method is what I was considering due to the depth of the gouging I inflicted. I also thought the satin arm-r-seal would reduce the depth a bit? Any recommendations on epoxy? I would only need a small tube. CaptainKlutz – wow! I appreciate you sharing that filler. I thought about using some Timbermate and some colored pencils. I like the staining aspect though, and the fact it has a reduced chance of being too dark after applied. Thank you! There is soo much knowledge here, and I have soo much to learn!! The steam trick only works on dents where the cells have been crushed. The steam will swell them to a certain extent and lessen the depth of the dent. Where there is tear out, it won’t work because there are no cells there to swell. You have a number of options. I wrote a blog post about using epoxy putty to fill defects that will work in your case. Your tear out is already rough enough around the edges to ignore the part about obscuring the defect. Also, since you plan to stain it, you will want to do that before any blending of color. Use an epoxy lighter than the wood is raw and stain it, then do the blending and seal it. Another possibility is a hard fill. There are a couple of different kinds and without a lot of time practicing, a regular hard fill will be your best choice. You can melt it with a soldering iron to drip it into the defects, and use a leveler to scrape it flat. It comes in dozens of colors and is used after staining and your first seal coat is applied. After you complete the fill, then you apply your remaining layers of top coat. For the hard fill, check out Mohawk Finishing Products videos on youtube. They have a ton of useful how-to videos on doing hard fill. The final fill is a shellac-type of stick. It’ll give the best results, but I don’t recommend it for a beginner since the repair is leveled with a burn-in knife and you need a lot of practice to get it right. One last thing — avoid clear fillers. They sound like they are the perfect fix, but they show up the most due to the way they bend the light that goes through them. I have battled tearout on tabletops in the past. It can be frustrating. I switched to a helical cutterhead on my planer, which seemed to cure the problem. I glue up pairs of boards into planks, and plane the planks to finished dimensions. Then I glue the planks together. This way I only have to clean up 2 or 3 glue lines for a wide table. 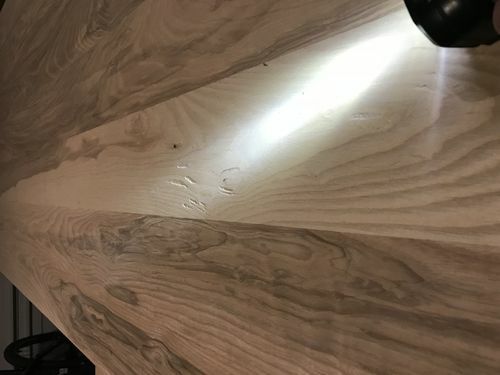 I sand the tabletop, rather than hand planing it. This way there’s no risk of tearout. A card scraper is another option, but it’s a dreadfully slow process. I know it doesn’t help on this table, but that’s how I’ve avoided the problem lately. Card scraper for sure you don’t need to scrap the whole table. Just lower the wood in the tear out area and blend outwards. You must of forgot about that card scraper right. Maybe use the other side? Rich – awesome! Thanks for taking the time and consideration in your response. The thread you created/linked was very informative and helpful with the pictures! I cannot express my gratitude enough!! Pintodeluxe- I like your approach! Once I convince my wife I’m pretty decent at this, the allowance for tools may increase. Aj2- I don’t have a card scraper. Seems like a valuable tool that would come in handy often! Any recommendations on a budget friendly one? waho9o6- your response is brilliant. I have a tendency to over complicate things. I liked this side for selfish reasons (grain/figure), but my brother wants it stained gray anyways!! The other side is perfect. Haha – too funny. Thank you for helping me keep it simple! I’m gonna try a variation of a method listed above, and if it doesn’t work… I will use the other side. Looking forward to seeing your fine table in the projects thread knottyknip! Practice on some scrap pieces before doing the whole table to make sure you like the finish. You’re welcome knottyknip and keep doing the good work! The steam trick only works on dents where the cells have been crushed. The steam will swell them to a certain extent and lessen the depth of the dent. Where there is tear out, it won t work because there are no cells there to swell. The final fill is a shellac-type of stick. It ll give the best results, but I don t recommend it for a beginner since the repair is leveled with a burn-in knife and you need a lot of practice to get it right. I started with these card scrapers, still have them.